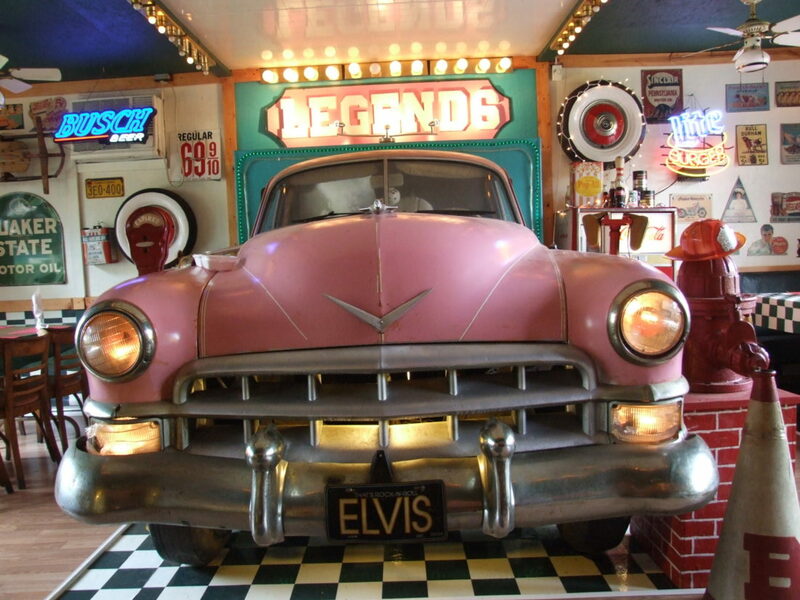 A pink 1948 Cadillac is the focal point in the 50’s diner area. Chef and owner Don Navaroli serves food fresh from the kitchen at Warren’s Legends Restaurant. Dessert choices are selected from the trunk of the separated back half of the Cadillac, painted yellow. 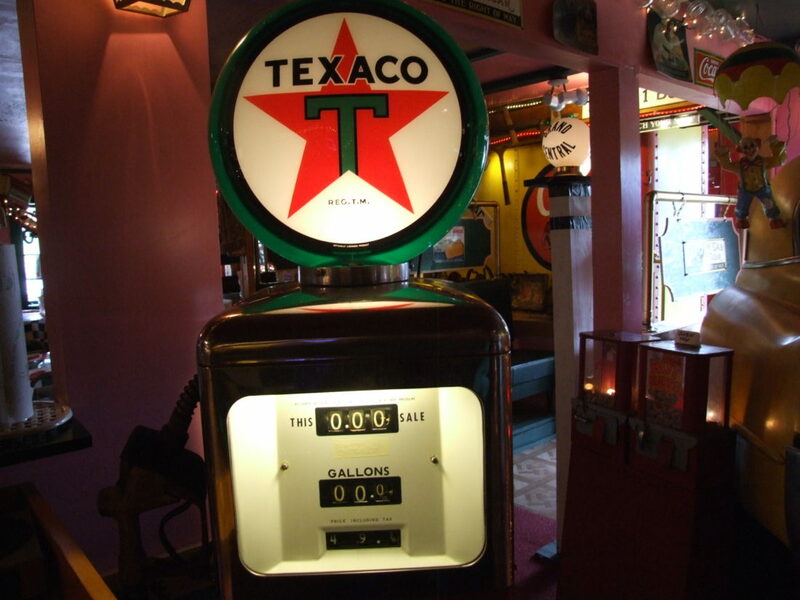 The 1950s Texaco slogan was “You can trust the man with the star, the big red Texaco star.” Texaco is one of many brands advertised on vintage gasoline pumps displayed in Legends Restaurant. Looking to enjoy a cool 50s diner environment, eat half-pound burgers served in a hubcap or watch your children’s eyes light up while eating in a 1952 Santa Fe Bayside caboose? What about 30s and 40s nostalgia for your parents’ anniversary dinner? It’s all in one spot at Legends Restaurant in Warren, Pennsylvania, just 24 miles from downtown Jamestown. 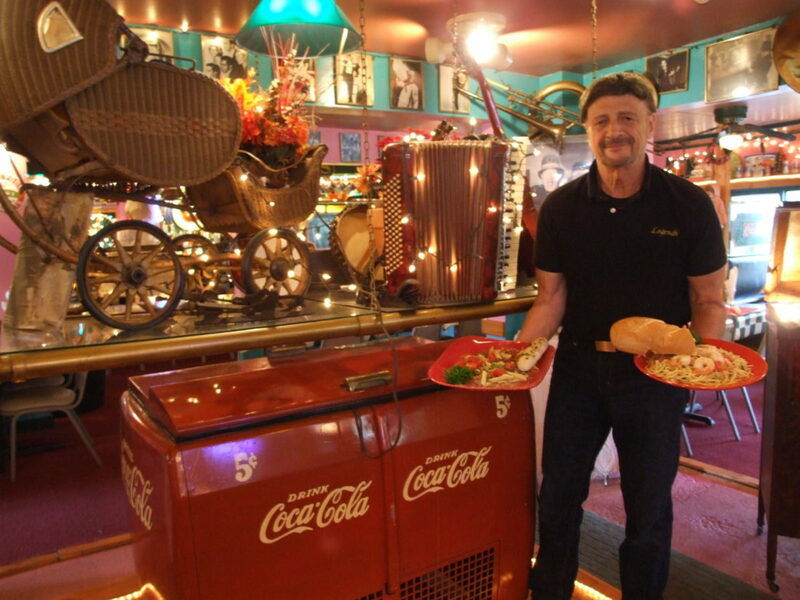 Owner Don Navaroli says prior to his purchasing the property in 1992, the eating establishment had been a livestock barn and then a diner, with only five menu items and a dance hall on the second floor. Navaroli recalls crawling through barns and going to auctions, estate sales and community wide yard sales, even pulling a 1948 Cadillac from a farmer’s field in Kane, Pennsylvania. “We built a deck, put the car on it, and then built the walls,” he said. The car was divided in two pieces — the front section was painted pink and the rear section was painted yellow. The front of the car appears to be coming out of the wall in the Cadillac Room, the fifties diner area. “It is complete with a curb feeler and a car hop tray from the former Warren A & W Root Beer,” Navaroli says. Nearby is a set of speakers from the old White Way Drive-In Theater that was once on Route 6 in Starbrick. Across the room is a Pennzoil gasoline pump and a dentist’s water station near a barber chair with a metal Top Value Stamp sign hanging above it. 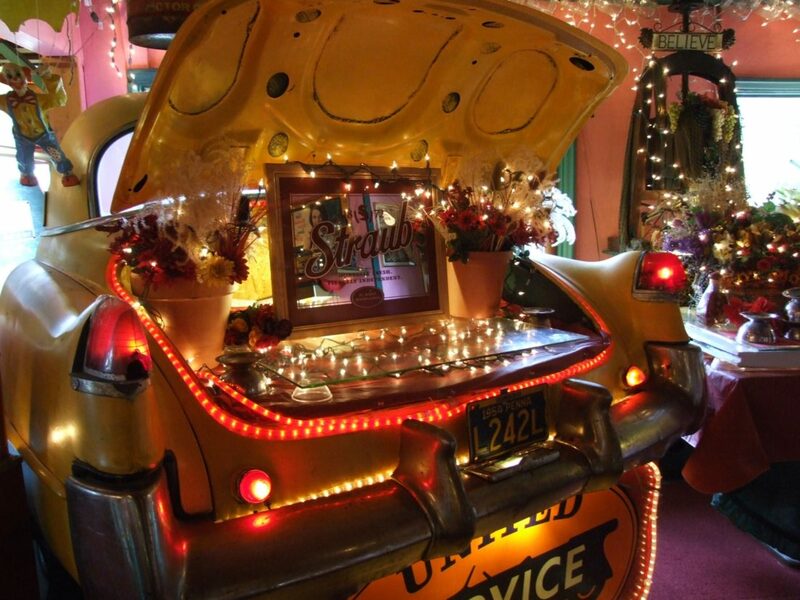 The Caddy’s rear clip is in another area of the building, with the open trunk serving as the dessert bar. In the same area, a claw foot bathtub serves as a salad bar with seafood salad, meatball salad, spaghetti salad and other items. A wooden corn chopper and a collection of vintage cameras are also displayed in this area. Navaroli’s father made wine every fall with the wine press that is now at home in the food establishment. A still used for making moonshine, rests on a window sill. The previous owner made Navaroli promise to never tell where it originated because of his fear of being arrested. “When people saw the atmosphere, they gave us things. When people give me things, they give me the history. It’s like a stroll down memory lane,” he says. A music section in the center of the main dining area displays an accordion, a banjo, a clarinet and two violins along with a ukulele, a trombone, a tuba and an old wooden squeezebox. Above an old Victrola is a ukelin which is a combination of a violin and a Hawaiian ukulele. Although many collections are displayed together, there are several more items interspersed throughout the rooms, such as the many dolls that are hanging here and there. An old root beer barrel, a copper Blackstone wringer washer, treadle sewing machines and primitive tools are also found in the mix, as well as a gasoline pump donated by North Warren State Hospital. Pictures and posters of numerous entertainers popular across decades, be they actors, singers or comedians, are scattered throughout. They are the Marx Brothers, Charlie Chaplin, Elvis, Marlon Brando, John Wayne, Marilyn Monroe, Humphrey Bogart, Clark Gable, Fred Astaire, W. C. Fields, Shirley Temple, Bob Dylan and many, many more. A pump organ inside the front door made a sudden appearance, according to Navaroli. “I got a call from some people that were moving saying ‘come and get this’ because they couldn’t get it on the truck,” he says. Not only is the environment fun and interesting, but so is the menu. Aside from several beef and steak options, six Mexican offerings and shrimp, chicken, barbecue rib and fish baskets, the restaurant is known for catchy menu names, For instance, you can order one of six Godfather Sandwiches, including Machine Gun Kelly’s Philly Steak, Al Capone’s Chicken Parmesan, Pretty Boy Floyd’s Grilled Chicken and John Dillinger’s Giant Fish Sandwich. Homemade fish chowder is served with all eight seafood entrees. Three varieties of loaded fresh-cut fries and eight burger varieties should cover the teens. Onion rings are served in a very small red wagon. “I try to keep it as unique as I possibly can. When I see things, I think ‘I wonder if I can do something with that,” Navaroli says. As if eating in the caboose with the model trains, crossing lights and signal lights isn’t enough to delight a child, there are five children’s menu choices that come with a free toy. The big draw is the all-you-can-eat prime rib Saturday nights. It is prepared Texas-style — grilled and served with all-you-can-eat salad and a finger pastry bar. The restaurateur started as a prep cook peeling shrimp and shucking oysters. He had an apprenticeship with chefs at the top of Mt. Washington in Pittsburgh and then became the chef at Wonderful Wanda’s in Oakland, Pennsylvania. He then worked as the chef at the Hilton Hotel in State College, Pennsylvania. When he gets some downtime Navaroli likes to sail at Kinzua Dam. He is also an avid jogger and enjoys going to his restaurant to meet new people, often offering recipes he has had in his possession for many years. The Pasta Fazool was his Italian-born grandmother’s recipe, and many of the other recipes came from a cookbook his Italian neighbors in McKeesport, Pennsylvania made and sold to raise funds for St. Perpetuus Roman Catholic Church. His wife, La Troy, is a doctor of wound care. They are the parents of 15-year-old triplets (two boys and a girl). Legends is located at 1725 Jackson Ave. Warren, Pennsylvania. They are open Thursday-Saturday from 5-9 p.m. Reservations can be made by calling (814) 723-9170. Combine salt, pepper, oregano, vinegar and oil. Toss with pasta, vegetables, meat and cheese. Rub salad bowl with fresh garlic clove before using for salad. Refrigerate until ready to serve. Mix sugar, salt and spice with zucchini. Add lemon juice. Cook until soft. Mix in cornstarch slurry. Cook until thickened. Pour into prepared pie crust. Add top crust. Bake at 400 degrees for 30 minutes or until crust is brown. Cut steak down middle to form 2 rectangles. Sprinkle cheese, salt & pepper, garlic, parsley, chopped eggs and pepperoni over both. Roll up and secure with string or toothpicks. Fry in hot oil then place in favorite sauce. Variations can be made with ham, salami, sausage, etc. Melt in butter in heavy skillet. Brown meat in butter. Add onion and sautÈ until soft. Add mushrooms. Season with salt and pepper. Simmer about 20 minutes or until meat is tender. Be sure flame is low. Stir in sour cream. Cook noodles to desired tenderness, drain. Spoon meat mixture over noodles. Top with a little parsley for color. Melt butter stir in all ingredients and simmer until tomatoes and parsley become soft. Mix in spaghetti top with cheese. Brown sausage in 1/4 c olive oil. Add onions, celery, basil and garlic. Saute until soft. Add water and rest of ingredients. Bring to a boil stir in cooked ziti and parmesan cheese. Serve. In medium saucepan over medium heat saute onion and garlic in oil, 5 minutes or until wilted. Add broth. Bring to a boil. Remove from heat. Stir in milk, potatoes and carrots. Cook until thoroughly heated through. Garnish with parsley.